Having swerved to avoid the eighties dustbowl antics of an unhinged Mel Gibson, I state on the starting grid that I have never seen Mad Max (1979) or its sequels. I therefore come to original director George Miller’s pimped-up fourth instalment entirely a freshman. The setting sees a fearsome dictator ruling over the desperate survivors of a presumed apocalypse by controlling the flow of water. On a long-distance trek to gather gasoline in a massive artic, one of his lieutenants, Furiosa, strays from the path. At which point he realises she is attempting escape. With his five wives in tow. He sends his army of anaemic freaks (‘warboys’) in pursuit, with captured ‘blood bag’ Max chained to one of the vehicles, part trophy, part life support drip. Max and Furiosa are united by a shared need to escape the warlord’s reign, but his terrifying arsenal of monstrous man and machine is about to rain down on them. Familiarity with the originals would no doubt be of advantage in orienting yourself in the twisted dystopia we are thrust into, but it truly matters not. What follows is a cavalcade of captivatingly choreographed chaos and stunning stunt work. 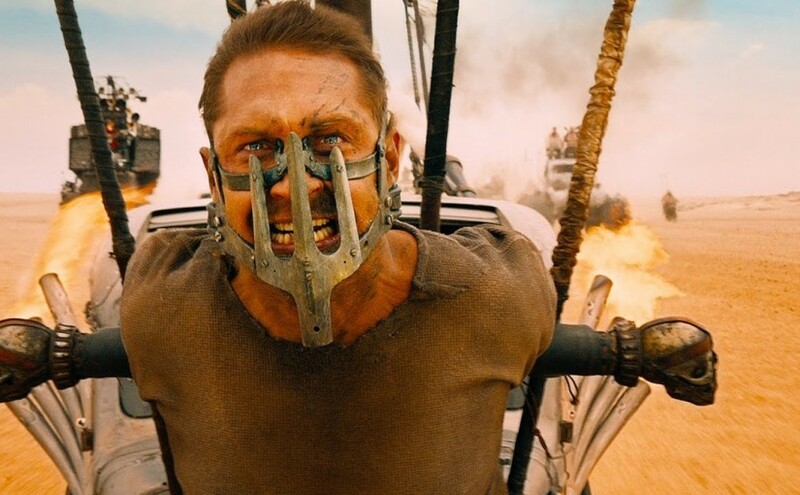 This generation’s Max, Tom Hardy is a monosyllabic brute of a hero. A spark of higher intelligence and morality in his eye, he shares the lead with Charlize Theron’s equally enigmatic Furiosa. Hardy’s understated physicality fits this fresh and frantic reprise brilliantly. His intense stare and deceptively modest form fizz with a kinetic potency that enhances the energy exploding all around him. Theron’s one-armed heroine is resolute and haunted, her character the key contemporary update to the series. But Nicholas Hoult is the greatest revelation. His is a frenetic and febrile frenzy of a performance as renegade warboy Nux. Just as a core objective of the upcoming Star Wars episode is to recapture the ‘real world’ feel of the initial trilogy, this film’s function is to convince with audacious yet authentic high-speed set pieces. By doing it for real. When CGI has advanced to the point at which it can no longer be detected, the natural result will be to distrust the validity of the cinematic spectacle. Thus we find ourselves, perhaps, in a phase of CGI backlash. Or, at least, the augmented appearance of one. There are only a couple of pauses to catch your breath in what is essentially one continuous chase sequence. And yet the picture’s success is that this never tires. Such is the constancy of the daredevilry, you cannot help become a touch immune to the peril. Even so, this level of inspired inventiveness grips to the finish line. As well as the pit stops afforded by the stationary breaks, respite is additionally provided by fabulous shifts of colour palette. Drinking in the cool moonlit blue of the stygian nightscapes comes as invigorating relief to the parched savannah of the sweltering desert. Mad Max: Fury Road is a relentlessly exhilarating rough-cut blend of the aesthetics of steampunk, Tatooine’s Tusken Raiders and The Cars That Ate Paris (1974) with the twisted visions of Jean-Pierre Jeunet, Todd Browning and Cirque Du Soleil. And all at breathless velocity. It’s an awesome array of mechanically mutated momentum and acrobatic attacks. As someone who never saw the preceding three episodes I am unqualified to pass judgement. But I would hazard a stab that this maxed-out upgrade has somehow pulled off the coup of being the most singularly exciting in the franchise.